Ever wondered just how much of the globe The Simpsons have covered? In short, all seven continents. They’re a very well-travelled family! But how do they stack up next to you and your travels, and can you catch up? If you want to travel like a Simpson, AttractionTix have got you covered! The Regina Monologues episode got a lot of attention here in Britain for SOME reason… maybe it was because everyone was keen to see what America’s favourite yellow family got up to on their break over here! 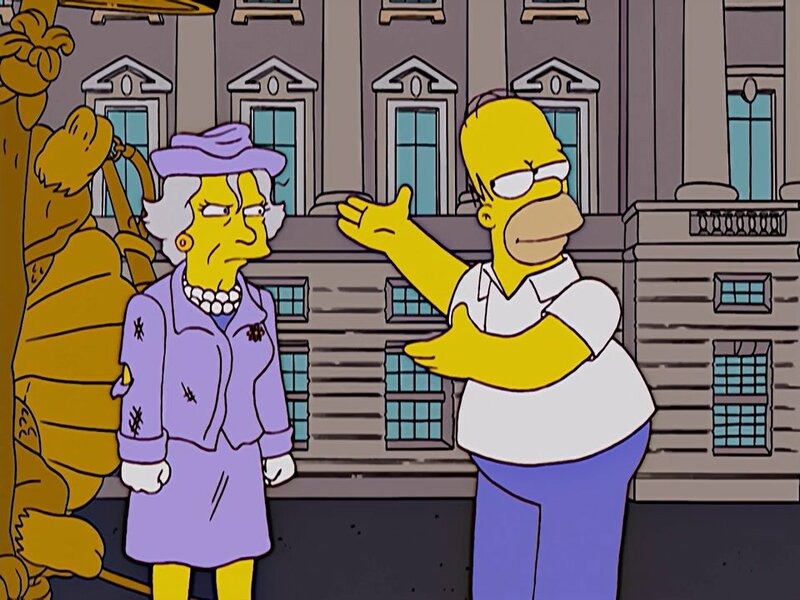 Ian McKellen, J.K. Rowling and Tony Blair, then the Prime Minister, who lent their voices to the episode, but after getting stuck on a roundabout, Homer crashed into the Queen at Buckingham Palace. (Sadly, Her Majesty couldn’t find the time to do the episode). Homer also spent the night at the Tower Of London, becoming the subject of one of the tours. (described as “the most villainous blackguard to be held in this tower since Edward the Puppy Eater”). Having been sent to Italy to pick up a Lamborgotti Fasterossa for Mr. Burns, the Simpsons end up on a little road trip of the country, stopping off at the Leaning Tower of Pisa. 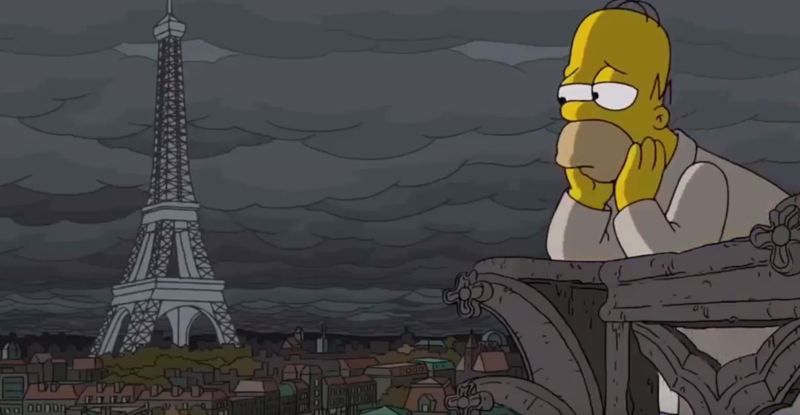 Homer is not impressed, sadly, and doesn’t even look at the tower, looking instead at the picture of it on his cup. (We can’t say for sure that those cups exist.) Lisa is suitably impressed though! After being chased by Sideshow Bob on a motorbike for exposing him as a criminal to the village he runs (this all makes sense if you’ve seen the episode), they crash into Trajan’s Column in Rome, and stop off to see Krusty at the Colosseum. Another tick on our list! After Homer and his bar buddies win $200,000 in the lottery, Carl Carlson flees with the money and is tracked down to his homeland of Iceland. They find out the Carlson family are seen as cowards in Iceland and convince Reykjavik that actually, he’s an okay guy. (Which he is). Just like when they came to Britain, the Prime Minister got involved, with the former Icelandic leader Jóhanna Sigurðardóttir making an appearance, alongside popular Icelandic band Sigur Rós. Once everyone is friends again (as is so often the case) they enjoy the Blue Lagoon geothermal pool, which frankly, is a must-do if you end up going to Iceland (be it to chase a friend who has stolen hundreds of thousands of pounds or not). While Homer has an ill-fated trip to the Big Apple, the rest of the family split and enjoy its glamorous sites, heading to Broadway, getting a horse-and-carriage ride around Central Park, and venturing to the top of the Statue of Liberty, something we could replicate without leaving our site! One of the show’s animators was sent to New York beforehand to take hundreds of pictures, so they could accurately replicate the Manhattan streets and buildings, and get a proper New York feel. In a bid to become vastly popular and well-known, Mr. Burns sets out to the highlands to capture the Loch Ness Monster. Bringing Homer with him, as well as Professor Frink and local boy Groundskeeper Willie, they drain the lake and actually capture the monster, after confusing him with a high school float that says “Stomp Aberdeen”. (“No way, Aberdeen rules!”) They got him back to Springfield, where, OBVIOUSLY, he went to work in the casino. Again, when you watch the show it all makes more sense than just writing it out. Speaking of casinos, it was in Las Vegas where Homer and Ned accidentally marry new wives after an all-night booze and gambling spree. Staying in “Nero’s Palace”, not at all an exact replica of Caesar’s Palace, they end up getting chased out of the city (that seems to happen a lot) and eventually dumped out the state of Nevada altogether. We’ve never had the trouble of marrying random people when we’ve gone to Las Vegas, so we don’t imagine it’s a common problem, but do let us know if it happened to you. The Simpsons have rocked up to California on more than one occasion. Most notably, when Homer joined up with Mel Gibson to produce his new film, while Marge and the kids went on an open-top bus tour of Hollywood and experienced the city (just like in New York, leaving Homer on his own to cause chaos). When Bart’s Internet cartoon Angry Dad got picked up to be turned into a short film in another episode, it was nominated for an Oscar, so obviously Bart and family had to go to the Dolby Theatre in Los Angeles to see if they’d won! And Alcatraz? Yes, it’s true, the Simpson family actually got incarcerated in Alcatraz, for not being patriotic. Bart accidentally mooned the flag and Marge went on TV, got wound up by an aggressive host, and claimed to hate America. To be “re-educated”, they went to Alcatraz, and as they escape, the Golden Gate Bridge is in the background. Of course, you and I both know that Alcatraz hasn’t been a functioning prison for decades, and is now open for tours year-round, but in this alternative reality of The Simpsons, anything is doable! Florida – Everglades, Kennedy Space Center and “Epcot”. Florida is a popular destination for many families around the world, including no less, The Simpsons! They’ve been a fair few times, and got up to the normal touristy stuff, including an airboat tour across the Everglades! If you’ve done this, you probably haven’t run over any alligators like Homer did, and will probably have enjoyed it a little bit more! Worth mentioning that in their various trips to Florida, they visited Epcot (although in their Universe it’s called EFCOT) for the Teacher Of The Year awards, and in a separate episode, also checked in at Kennedy Space Center, where Homer endured rigorous astronaut training before being blasted into space. Even in The Simpsons, Florida remains a popular and attractive place to go! Homer only briefly visited Paris when he and Carl went to the Nuclear Power Conference. After Carl extends their stay indefinitely, he starts to miss Marge and gets overworked. In fact, every time one of the Simpson family seems to go to France, it rains. Bart went to a non-specific French city in a very early episode where he was forced to work on a wine farm, and it rained on him a lot there too. So there you are, if you want to truly travel like a Simpson, you’ve got some catching up to do, but they see a lot of the sights AttractionTix has to offer! Really like this – love the way education and Simpsons merge. Remembering how we were surprised that our six year old new the name of the then American president. Having thought gosh it is good he is learning so much at school he told us so saw it on the Simpsons.